Chipotle Queso (Copycat) recipe is an all natural creamy chili cheese dip with tomatillo salsa in just 20 minutes that tastes just like you’d get at Chipotle! We love creating restaurant meals at home! Round out your Chiptole meal with Chipotle Barbacoa Beef, Chipotle Corn Salsa, and Chipotle Lime Chips and Guacamole. 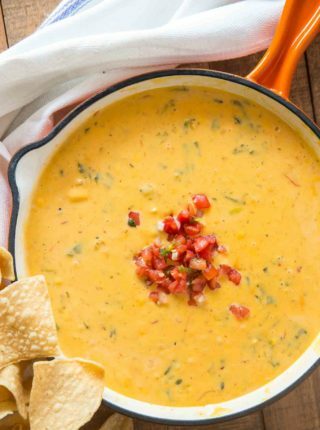 If you are a lover of queso dip, you’ll know that homemade queso is most often made with processed cheese combined with canned tomatoes and green chilis. A crock pot is where these ingredients melt together. 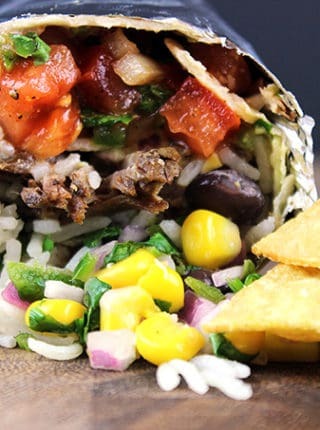 Chipotle Mexican Grill prides itself on natural ingredients and preparing those best ingredients by hand so this copycat recipe follows their lead. 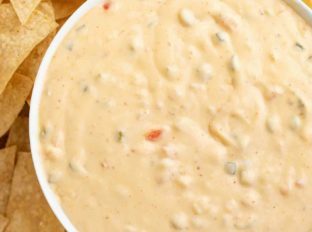 The Chipotle queso ingredient list may be long, but the process of making homemade queso dip is simple. A Dutch oven and a whisk are the tools you’ll need. Drizzle this chipotle queso dip over your tacos, burritos and bowls to bring that even better than Chipotle taste home. Chipotle’s queso is not without a bit of controversy. Customers thought the restaurant’s queso made with natural ingredients didn’t taste like the queso people grew up eating. The restaurant reintroduced queso to their menu and having tried it again this time, I liked it enough to test it, recreate it and add it to the blog! (I’m looking at you Panda Express General Tsao Chicken, you were NOT good). 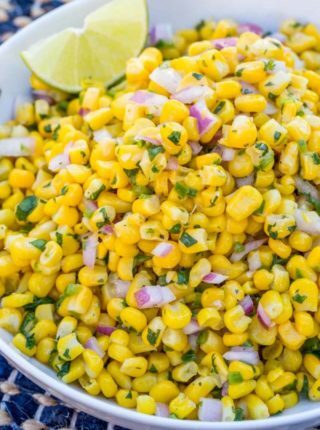 The cheese topping elevates a Mexican buffet whether you are serving burritos, tacos, or bowls. 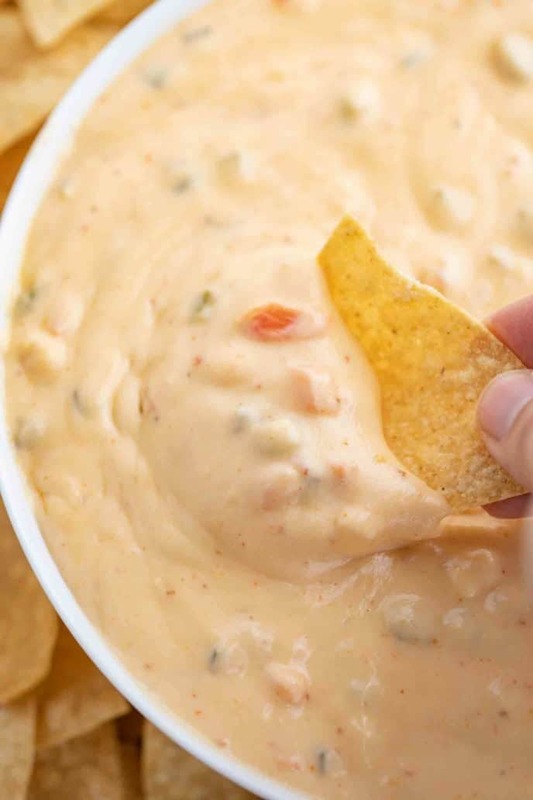 Queso dip is also a great party food ready for game day. Take the challenge upon yourself to try this Chipotle queso copycat recipe and compare it to both the restaurant version and the crockpot version. 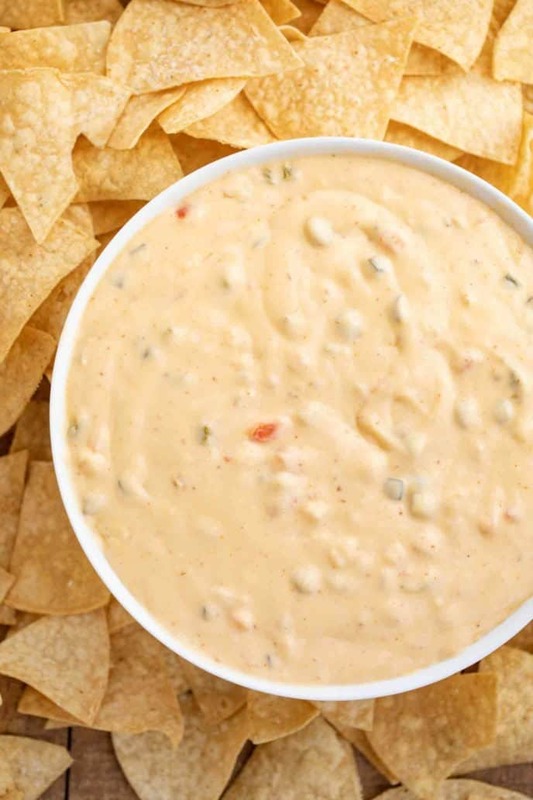 We think you’ll find this creamy queso dip to be a winner! Use a Dutch oven or other heavy-bottomed pot to encourage even cooking, if you use a thin bottomed pot you will end up with burned spots and the queso will not be creamy. Give the onion, bell pepper and jalapeno time to soften before adding the remaining ingredients, you want to cook low and slow. Tomatillos are not green tomatoes, although that is what they look like. Tomatillos are a popular ingredient in Mexican cooking. In this queso recipe, the tomatillo salsa adds depth of flavor and an authentic Mexican taste. A roasted tomatillo salsa would be an ideal choice. You may swap canned tomatillos, chopped, fresh tomatillos, or another type of salsa verde for the tomatillo salsa. Whisking constantly is the key to a smooth queso dip. Start whisking as you add the milk and continue to do so until the cheese have been incorporated. Queso is best served warm and soon after preparing. You can use a crock pot (the mini size works well) to keep this cheese dip warm until you are ready to eat. Keep your whisk handy as you’ll need it to stir in the lemon and lime juice right before serving or the cheese sauce may break. Wet your clean fingers in lime juice and wipe across the tortillas. Let them sit out for five to ten minutes while you make the guacamole. Cut the tortillas into six even triangles. Heat your oil to 375 degrees. If you don’t have a thermometer, drop one chip in the oil and if it comes to the surface bubbling the temperature is good. Cook for 20-30 seconds, you aren’t looking for them to brown. Remove with slotted spoon. Sprinkle salt over them immediately. You can see the step by step photos on the recipe page here. Love copycat recipes as much as we do? Great! 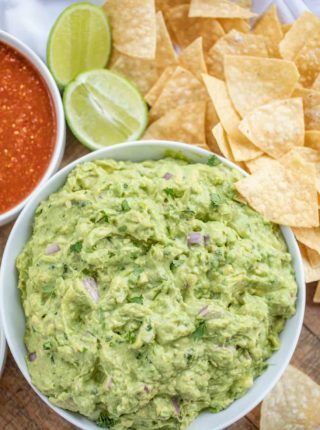 Check out our Copycat Category of recipes where you’ll find the best dishes from Chipotle, Chick Fil A, Chili’s, Panda Express, Olive Garden, and more! Chipotle Queso (Copycat) recipe is an all natural creamy chili cheese dip with tomatillo salsa in just 20 minutes that tastes just like you'd get at Chipotle! In a large dutch oven add the vegetable oil on medium high heat along with the onion, bell pepper and jalapeños and cook for 5-6 minutes, stirring occasionally until softened. Add in the canned tomatoes and chilis, tomatillo salsa, garlic, flour, chili powder, cumin, oregano, salt and pepper and mix well. Add the milk in, whisking well, then add in the tomato paste, vinegar and cheese and whisk until the cheese is melted. Right before serving whisk in the lime and lemon juice and serve. Wow, this looks amazing! It’s been ages since I’ve had queso and must try this soon. Thanks! This is all I need for a real fiesta! Love that you included instructions on how to make the lime tortilla chips! A must-try! It’s definitely hard to stop once you start! My friends are going to be excited when I make this for them!!! Using a dutch oven is such a great idea!